Stetson University students (from L to R) Regis Steighner, Megan Christopher, Alex Overdijking and Nathaniel Diamond won first and second place prizes at the International Business Ethics Case Competition (IBECC). 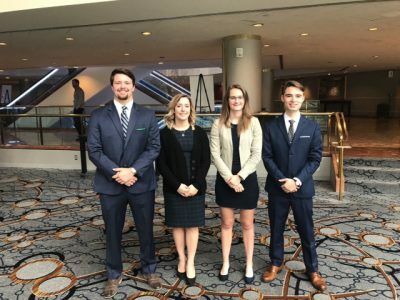 Stetson University students won first and second place prizes at the International Business Ethics Case Competition (IBECC) held this past week in Boston, Massachusetts. The undergraduate field of competitors across all brackets included 30 institutions from the U. S., Spain, Turkey, United Kingdom, Kuwait, China and Australia. The Stetson team consisted of Megan Christopher, Alex Overdijking, Nathaniel Diamond and Regis Stieghner, and was coached by professors Jim Beasley, John Tichenor and Areti Vogel. They competed against undergraduate teams in the three categories of the competition. The Stetson team won second place in the full presentation (30 minutes) in a division including Holy Cross, Montgomery College, UMass-Lowell, Loyola Marymount University and Istanbul Commerce University. Two team members, Christopher and Overdijking, won first place in the 10-minute presentation in a division that included Mt. Holyoke College, Marist College, University of Miami, University of Navarra and Istanbul Commerce University. “The IBECC judges were very impressed with the polished presentation and argumentation skills displayed by all four students on our team,” said Jim Beasley, Ph.D., professor of management in the School of Business Administration at Stetson who accompanied the team to Massachusetts. Teams invited to the IBECC competition select their own case for presentation at the event and the Stetson team prepared a case entitled, “Allergan Sell Restasis to St. Regis Mohawk Tribe: Creative I.P. Solution or Gaming the System?” Student teams were asked to assume the identity of consultants who are offering advice to a company considering how to deal with an ethical dilemma facing the firm. They were required to deliver a 30-minute presentation, a 10-minute presentation and a 90-second presentation on the financial, legal and ethical implications of the decision facing the company board of directors.